Club Sandwich deluxe is my way of serving this sandwich, loved by many. There's just one little twist that makes it really scrumptious. Cheese - either Gouda if you prefer it mild or mature cheddar if it should have a more cheesy taste. Mix together egg and milk in a bowl. Set aside. Spread some butter on the slices of toast. On one slice add a bit of egg salad and then the ham. Close with another slice of toast. On this slice add the cheese and the sliced tomatoes and close with the last slice of toast. 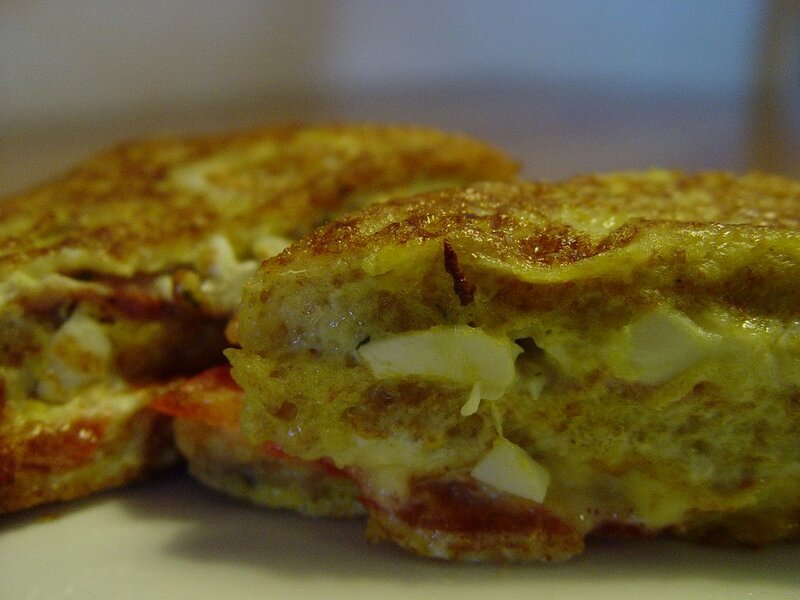 Soak the sandwich in the egg and milk mixture and put in the frying pan. Fry this quickly on both sides until nice and golden brown. Enjoy with a large bowl of salad. Fantastic alternative to the normal sandwiches. Dipping them in the egg mixture gives it just enough softness to make it a light meal. Tom was delighted with these sandwiches. Soeren found them extremely tasty even though some of the filling kept falling out! This was something that Soeren wanted to take in his snack box the next day too. So if you should make these make sure you have enough of the ingredients leftover to whip up some fresh sandwiches the next day. What an interesting twist on the classic sandwich! Try dipping a cheddar cheese sandwich in beaten egg and frying until golden and the cheese is melting, a friend of mine used to make these and called them cheese delights! Hope you don't mind me linking to your site? 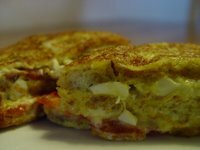 I love the whole idea of dipping sandwiches in an egg mixture an frying. It adds a little "zing" to the whole sandwich idea. I appreciate you linking to my site. I have been playing with the idea of adding a "My fave Food Blog" section on all my blogs like you have. I will also probably link to your blog, if I may!